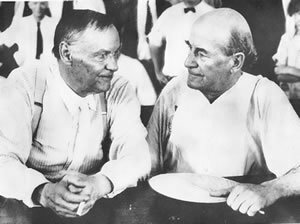 The Scopes trial took place on a hot July in 1925 in the little town of Dayton nestled in the Cumberland Mountains of Tennessee. In a time when modern court trials can drag on for months or even years, it is amazing to consider that the Scopes trial lasted only 12 days (July 10-21)-including the selection of the jury! But why did this trial occur in Dayton, and who were the people and what were the issues that made this trial so important? Scopes had no background in science and had little interest or understanding of evolution. 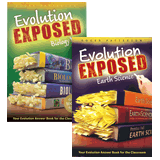 Bryan was well informed about the creation/evolution controversy and regularly corresponded with scientists of his time, such as Henry Fairfield Osborn, on the evidence for and against evolution. While Bryan was a staunch creationist and a strong critic of biological evolution, he accepted geological evolution and an old age for the earth. In his autobiography The Memoirs of William Jennings Bryan, Bryan said that his objectives in the Scopes trial were to “establish the right of taxpayers to control what is taught in their schools” and to “draw a line between teaching evolution as a fact and teaching it as a theory." Clarence Darrow was an immensely successful criminal lawyer who specialized in defending unpopular people and radical causes, often winning seemingly impossible cases. His agnostic convictions led him to believe that man’s actions were ultimately just the result of body chemistry, and that concepts of good and evil were essentially meaningless. 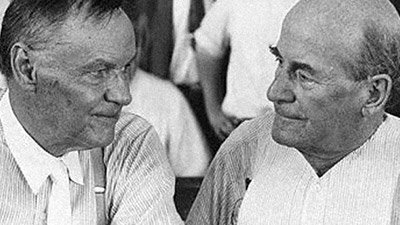 In his autobiography, The Story of My Life, Darrow explained his purpose for participating in the Scopes trial: “My object and my only object, was to focus the attention of the country on the program of Mr. Bryan and the other Fundamentalists in America." 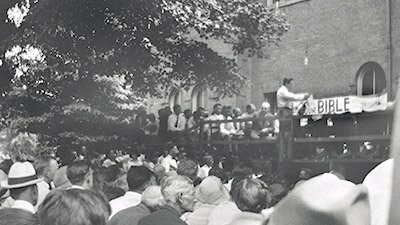 Technically, the only legal issue in the Scopes trial was: did John Scopes violate the Butler Act by teaching that man descended from a lower order of animals? 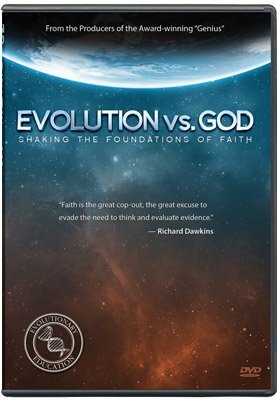 For both Bryan and Darrow, however, the real issue wasn’t Scopes’ guilt or innocence, but rather should evolution be taught as fact in the public schools? Darrow had hoped to have a number of evolutionist scientists testify in the court to the “fact” of evolution, but this wasn’t permitted by the judge because the evidence for evolution was technically not at issue in the trial and Darrow refused to allow his evolutionists to be cross-examined by the prosecution. As a result, most of the testimony by the scientists at the trial was written and filed into record-none was heard by the jury. John Scopes was found guilty of violating the Butler Act and assessed a fine of $100, but was subsequently acquitted by the Tennessee Supreme Court on a technicality. The Butler Act itself was repealed in 1967 in Epperson vs. the State of Arkansas. Today in Tennessee, as in all other states in America, a mindless and purposeless process of evolution is the only legally permissible explanation for the origin of man and all other forms of life in the public school science classroom. To see firsthand how the propaganda piece Inherit the Wind has continued to deceive a whole generation with its countless distortions and inaccuracies, be sure to watch the DVD Inherently Wind: A Hollywood History of the Scopes Trial. This DVD gives side-by-side comparisons of Hollywood’s version of the trial versus actual historical events. Once you know the truth about what really happened in Dayton, Tennessee, why not help to set the record straight by passing along a copy of this DVD to your local public school or donate it to a local library? Darrow’s Statue: Another Win for Evolution?